Discovered a horrible, awful, ABSOLUTELY GAME-BREAKING bug. Talents that granted a boost to global speed (Nimble Combatant and Adrenaline) were affecting your base global speed, rather than adjusting it with global_speed_add. As a result, there was a possibility that interactions with other global speed effects (slows, etc) could cause you to PERMANENTLY loose global speed. Please, please, please double check your add on version to make sure it has updated properly. If it is not 2.3.2, download the new version from te4.org (link in the O.P.). I believe this reduction to global speed may have been causing a number of other talents that update their effects each turn to malfunction, resulting in a... titanic number of error reports from a few players highly dedicated to hitting the 'send' button every time an error popped up. I still have not been able to reproduce these errors, and the reports that they fire are less-than-informative. Hopefully this gods-awful bug was the root, but even if it was not, it absolutely had to be fixed. Nearly all Prowler talents have had their Equilibrium cost reduced (again). Many talents which also had a Stamina cost have had this cost slightly increased. Several talents have also had their cool down reduced. Talents that healed or reduced Equilibrium have all had these values somewhat increased, particularly Wild Attunement. Now grants a bonus to Strength as well as Constitution, primarily to alleviate the cost of equipping armor. This bonus is also based on your Willpower and scales from ~8% to ~20% ( vs. ~15% to ~40% for Con). Now grants movement speed rather than global speed, and at a much greater rate. Bonuses now cap at 6 enemies, rather than 4. The passive Armor and Spell Save bonuses have been increased. Focus will no longer generate a Psi Damage Shield when moving, as before. Now, while the talent is sustained, any damage greater than 33% of your maximum life will trigger the Focus Shield effect. Focus Shield reduces all incoming damage by 70% for 3 turns, but also reduces all damage you deal by the same amount. The previous shield effect made you nigh-on-invincible to 'minor' damage, but still left you susceptible to large bursts of damage. Prowler has a fair amount of life regen in their kit, so minor damage is not as much of a concern. This new effect, while not completely blocking damage, should provide you with the opportunity to heal, retreat, etc, after being hit by a particularly devastating blow. The Prowler's greatest strength is mobility, and this effect better ties into that ideal. I'm not sure I'm totally satisfied with it's functionality, however, and I would love some feedback. Last edited by nsrr on Wed Aug 10, 2016 6:25 pm, edited 1 time in total. Thanks mate! Gonna try it now and spam that send button. Just to be absolutely clear, when you hit 'Send' on an error report that pops up while playing, it only goes to the devs (namely Stunt and DG). It is only because Stunt contacted me that this problem was brought to my attention at all. If you encounter any errors with 'Prowler' in the traceback, please report them HERE. Spamming send is only going to give Stunt a headache, and he's got enough on his plate already. Also, it will not result in the error being fixed. Problems with this add on can only be fixed if I know about them. Also, thank you! 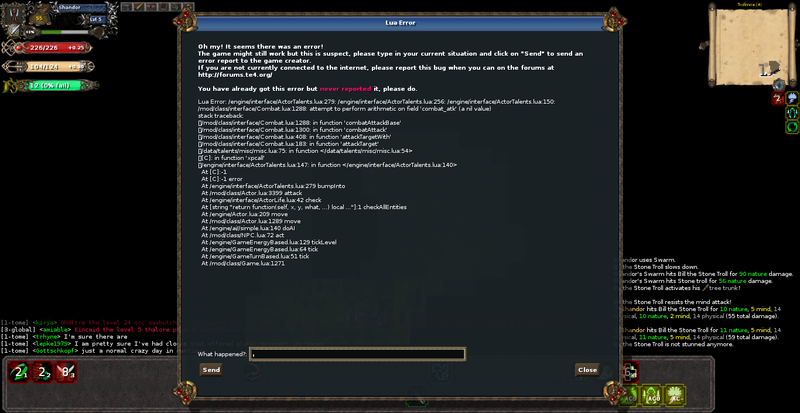 'combat_atk' is a recurring theme in a lot of these errors. As much as I want Prowler to have a way to reduce attackers accuracy, I may have to change this effect to something else until I can figure out what the heck is going. Also, as a side note, if you save and exit the game you can then open the text file te4_log from your ToME folder. Search for 'error' and you should easily be able to find the error text. If you exit immediately after the error pops up, this should be at the very end of the file. Then you can copy and paste that text, rather than uploading a screenshot. Minor issue: if your encumbrance is over what would be your limit without the strength-boosting skill, then you get the "you are too encumbered" and "you are no longer encumbered" message every step you take. Doesn't seem to affect anything else but it is annoying. I can see that getting pretty annoying. I can't think of a simple solution... I may end up changing the effect. The primary reason I gave them a Strength boost was to alleviate the requirement for Armor, since even Light armor requires some Strength. Off the top of my head, one answer may be to cause the talent to change the requirement for Light Armor from Strength to Dex, and have it give a passive, talent level scaling, boost to max encumbrance, and 'pseudo-passive', scaling boost to physical power. The issue is the fact that the talent updates the bonus each turn in order to ensure that it is always scaling to your current stats. So, effectively, you are losing and gaining the bonus at the start of each turn, causing those messages to fire. Really, I just need to burn this class to the ground and rebuild it from scratch, now that I actually have some idea what I'm doing. As a hybrid Rogue class, it's going to be due for a major update when 1.5 drops, so I've been considering some potential changes already, but I will stick with minor updates, as needed, for the interim. In less complainy news, I just completed a run with it and it was pretty fun. Ended up ignoring stealth altogether and just maxing out every skill that boosted psiblade damage + attack speed. Elementomancy is pretty ridiculous - you can just stack up every call and shred+flurry most bosses, and if they survive you can dash back, heal up and wait for everything to cool down. Even aside from how strong it was, it was just really fun to play. That's great to hear; I'm really glad you enjoyed it! Honestly, considering how little I knew when I started this class and how shaky the development has been, I'm pretty happy with how well it has shaped up. I knew when I reworked Elementomamcy that it was going to be really powerful, with enough investment. I haven't dug through the vault for a while, but as of the last time I did, not many people had gone for the tree, despite all it has to offer. The whole 'stack all the calls and then shred and flurry' thing was exactly what I was going for, so I'm glad to see someone exploiting it to its fullest. I originally wanted to make this class because I love Psiblades and I wanted a Rogue-y melee class that could really make good use of them, and I found that it was hard to pull off with an Adventurer build. So, I'm really excited to hear that it worked so well (even if it was, maybe, a little too well ). When I get to the rework, I plan on really focusing on the theme of speed and mobility that arose throughout the development. The class is much more like a Wilder Marauder than a Wilder Rogue, really, and I plan to continue in that direction. New Stealth offers a lot in the way of survivability that I have tried to give Prowler in other ways, so it may not make the cut for next version. As you pointed out, a Prowler doesn't really need Stealth and the biggest thing it has to offer is the guaranteed Shadowstrike crits. Which aren't really necessary, either. I have a vague idea for a 'Camouflage' tree, but it's not really fleshed out at all. After some consideration, I decided that the Strength boost I recently added to Agile Defender didn't really fit the talent and was not really needed. As pointed out by echo42, this could cause a constant application and removal of the 'over-burdened' effect, which could get quite obnoxious. The primary reason that I added this bonus at all was to make equipping Light armor a little less stat intensive, considering Strength is a tertiary stat for the class, at best, and having to stack gear just to equip leather armor is tedious while not really adding meaningful limitations. As such, Agile Defender once again only boosts Constitution. However, it will now also change the requirement for equipping Light armor from Strength to Dexterity. The Strength boost was a rather lazily applied band-aid on the problem that I really wanted to solve, and if I had given it more than one minute's consideration I would have implemented this solution instead. Something I just realized: will 1.5's mobility update do anything to Prowlers? Strider was removed I believe. Yes, as far as I know, it will affect them. If, by chance, the new mobility tree was given a different name and the old one retained its name, then it would not be affected. I believe the old tree will be retained in the code (mostly for old charters loaded into 1.5), so one quick and easy fix would be to just give them the old tree. However, considering how many trees have been affected (both dual weapons, survival, mobility, stealth), what the class really needs is a bit of an update. Really, I'd like to rebuild it from the ground up, but I don't have the kind of time that would require any more, nor am I sure when I might find some time. Looks like the 1.5 beta is moving along pretty well, so I will try to find the time to at least create a build that will use the new trees, ready for when 1.5 goes live. But, there has been a bit of an update. Reworked many passive talents to use a proper passive method. Removed interaction with the old Mobility tree. Talents with cooldown affected by Strider now have the minimum cooldown possible before. Removed old Dual Weapon Training tree. Now grants a chance to negate incoming damage, rather than the Focus Shield effect which triggered on high incoming damage. No longer reduces Mind speed.